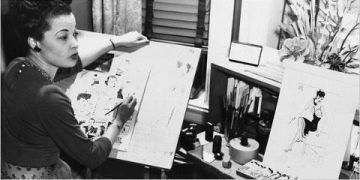 Jackie Ormes is widely considered the first African American cartoonist in the United States. She created four comic strips, Torchy Brown in Dixie to Harlem (1937), Candy (1945), Patty Jo ‘n’ Ginger (1946), and Torchy Brown, Heartbeats (1950). Ormes was born August 1, 1911 in Pittsburgh, Pennsylvania to parents William Winfield Jackson and Mary Brown Jackson. Jackson owned and operated a printing business and was the proprietor of a movie theater. Mary was a homemaker who became a single parent when her husband died from motor vehicle accident in 1917. Jackie and her sister, Delores Jackson, were briefly raised by their aunt and uncle as a result. Jackie Jackson married Earl Ormes in 1936. They lost their only child, Jacqueline, to a brain aneurysm at age 3. They remained married for 45 years until Earl’s death in 1976. After high school, Ormes obtained her first job as a proofreader for the Pittsburgh Courier in 1930. Ormes also completed freelance pieces on police beats, court cases, and human interest topics. Eventually she began to produce comics for the newspaper and established her career as a cartoonist. Her first comic strip, Torchy Brown in Dixie to Harlem ran for 12 months between 1937 and 1938. Torchy Brown in Dixie to Harlem described a small town girl who migrated north to become an entertainer in Harlem. The cartoon resonated with many of the newspaper’s readers because it reflected the then contemporary struggles of hundreds of thousands of African Americans who were part of the great migration from the South to the North. The reason for the abrupt end of the popular cartoon strip is not known but it is presumed to be due to an end in her contract. Seven years later, Ormes returned to cartooning at a new paper, The Chicago Defender, in 1945 with the brief comic strip titled Candy which ran for four months on the editorial page. She also returned to journalism at this time, writing as an occasional special assignment reporter and as a social columnist. In 1946, Ormes created the comic strip Patty Jo ‘n’ Ginger which ran for 11 years. This was one of her most influential comic strips. The little girl, “Patty Jo” depicted in the comic was thought to be a representation of her deceased daughter, Jacqueline. Also, many of the cartoons contained political and social satire thought to outline some of Ormes’s own opinions about issues of the day. The popularity of the comic strip led to the creation of the “Patty Jo” doll in 1947, the first African American doll based on a comic character. With features painted on by the cartoonist herself, the doll is now a highly prized item for collectors. Zelda Jackie Ormes died in Salem, Ohio on December 26, 1985 at the age of 74 of cerebral hemorrhage. Jasmin Williams, “Meet Jackie Ormes and Torchy Brown,” New Amsterdam News 103:29 (July 26, 2012); Nancy Goldstein, Jackie Ormes: The First African American Woman Cartoonist (Ann Arbor: University of Michigan Press, 2008).